As a lifelong resident and full time real estate agent, Kris knows all about property in Portage, Baraboo, Reedsburg, Westfield, Wisconsin Dells and Columbia County, Marquette County, Sauk County, Adams County and Green Lake County. 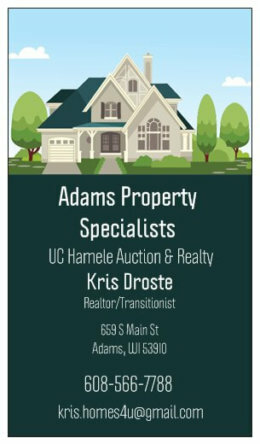 Whether you are looking for your first home, moving up to a larger residence or searching for a vacation property or lake home, Kris has the area knowledge to help you find just exactly what you are looking for. If you are a seller, Kris can help you determine just the right selling price for your property. And her work with people moving into the area can help drive more buyers to your property. Part of the top-selling real estate team in the United Country Hamele office, Kris and her team will get your property sold. A Certified Default Resolution Specialist, Kris works with both buyers and sellers participating in a short sale.